It is also a Full Moon this equinox, so Mother Moon is shining brightly, radiant in her mantle as Spring Goddess and Mother Creatrix and in the beauty and harmony of astrological Libra. This energy holds the potential of being able to see not only the beauty that is held in the potential of Spring’s grace but also in the mantle and cloak that is presented. Whether it be the care and nurturance of the Mother or the youthful exuberance of the Maiden, life flows strong and abundantly this time of the year. The Equinox provides the pause to “smell the roses” that will be and to see the first shoots of what is pushing up through cold ground. The Illuminated Wheel of the Witch’s Year glows brightly with the promise of Spring and the call to balance with the germinating of new life. The time of the Vernal Equinox is at hand and the Goddess as Maiden breathes out the exhalation of new life so that all may breathe in the fertile energy of the green world’s seed of potential for enlivening. We began this cycle of the Waxing of the Light at the time of the Winter Solstice and we stand at the mid-point of its expansion towards culmination at the Summer Solstice. We carry into this space of balance what has been refined by the light of renewal and the awakening of mind, heart and spirit in preparation for the Great Work at hand. We have tended to this light and nurtured it as the fires of Imbolc sustained the growing and active potential within and have been protected by the Goddess’ mighty sword in repelling what would extinguish those tender flames that are needed for life to find its way to manifestation. We find ourselves now at the time of the Vernal Equinox and the exuberance of the Maiden takes hold. This is the pause of respite when there is equal balance of day and night. This is the point of integration and synthesis of the work and effort offered beginning at the Winter Solstice. The Vernal Equinox holds the product of renewal and the stirrings of the increasing state of awareness illuminated by the potential that is held within the fertile space of manifest form. We find the space of balance within ourselves and seek out the opportunity to shine that light more brightly as it has strengthened and we open to taking in more of the light that surrounds us. We begin the dance of enlivened exchange shifting eagerly between what has been and what will be in anticipation of the lover’s embrace and the sacred union to occur at Beltane. The earth responds in kind and maintains its own balance of the light and dark needed for the greening of the earth. Too much sun will dry out what is clamoring to quench the thirst of becoming. Too little light will over saturate and stagnate in break down of surrender to non-viability. The un-tempered light of the Maiden’s form awakens and stimulates in reaching upwards what lay beneath the enlivening of graceful step and quickening breath. 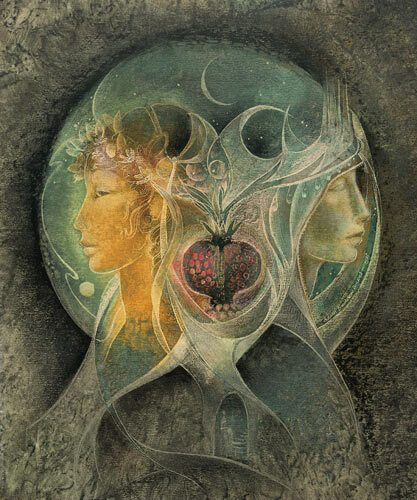 The darkness of the womb in which it lay also strives towards balance of what will survive the next stages of germination as Gaia’s wisdom and ebb and flow of force and form brings forth the verdant world from her womb of life and death. This interplay and vacillation of one to the other ensures the cycle of waxing light and the blossoming of earth will continue. The Maiden’s body becomes that of the Mother, Gaia. The youthful budding of Maiden’s breast will become that which sustains life in Mother’s pregnant fullness as Her womb of fertility ripening for the planting of harvest’s reaping. Everything about this Goddess is light-filled with the radiance of innocence that openly embraces all of life and breathes the exuberance of her energy into what surrounds and enfolds and the surrender of that innocence to become the sustaining earth itself. This is the duality of her nature. The naiveté and innocence of the Maiden awaiting the seed of union and the destiny of that act in transformation into the pregnant Mother of all that lives upon and inhabits the earthly world. Find a comfortable space where you will not be disturbed and settle into a supportive chair or with your back braced as you sit on the floor. Breathe deeply and fully a few times and with each subsequent breath allow yourself to settle more deeply into whatever you are sitting in or on. Close your eyes and gentle pull your conscious mind up to the space between your brows and envision an inner screen of your making. You are both observer and participant in the experience and you as you breathe more deeply and establish a steady flow of rhythm you see a point of blue light just ahead of you. As you continue to inhale and exhale this point begins to expand and forms a dense yet very refined mist of pale blue flickering light. You breathe into the stretching of this light as though to form a veiling or threshold and see yourself stepping through the mist. You emerge at the edge of a beautifully landscaped garden. Green bushes, flowering trees and a tapestry of assorted flowers spread in front of you like a welcoming carpet. You see that there is a stone path just to your right and curious as to what lay along its course you turn and begin to step forward. Your feet make a gentle tapping sound as each moves from circular stone to circular stone and each footfall seems to release the fragrant scent of thyme that grows between and around each stone. You walk along taking note of the sunlight pouring down warm and strong and the blending of sounds of birds, insects and the gentle rustle of wind through trees. As you move ahead taking in the beauty of the surroundings you are drawn to a space just off the path, barely visible yet seeming to call you to come sit in its cover. You take note of a beautifully carved wooden chair nestle in the corner space of flowers, small bushes and a large tree. Knowing instinctively that this is your intended destination, you sit on a curved wooden garden chair and look out at the beautifully colored flowers surrounding you. The chair supports you comfortably and feels like a warm embrace from sun heated fragrant pine. You breathe in deeply and the blended fragrance of garden flowers and green moist leaves fills your nostrils. The sun is warm overhead and you feel its gentle heat moving through you. As you sit taking in the sights and sounds you continue to deepen your breaths. Each exhalation seeming to release all of the tensions or stress that you may have carried into this garden. You feel yourself becoming lighter and lighter with your breath coming easily and deeply. You relax into the support of the garden chair and close your eyes. You are calm and completely at peace in this space. You open your eyes and see just in front of you a beautiful blue butterfly. It hovers over the tips of several of the flowers, stopping here and there and fanning wings open and closed. You follow the pattern of this beautiful creature as it moves from flower to flower and comes to rest directly beside you on a tall coneflower. You remain perfectly still, not wanting to disturb it and it goes about its work of busily gathering what it needs. You remember that you have seen these same butterflies in the carefully tended landscape around your workspace, but have never taken the time to pause and take in the peace and beauty of their flight. You vow that you will carry this image back into your waking/working world and it will remind you of the serenity you have felt in this space. As these thoughts move smoothly through your mind, you realize that some time has passed and still the butterfly remains on this singular flower near you. You draw this image deeply into your memory and breathe deeply feeling with each flutter of the butterfly’s wing even more tension being released. You close your eyes, resting into this gentle rhythm of breath that is in sync with this creature of beauty and serenity. You take a few more deep breaths in this manner and open your eyes to gaze once again on the fluttering of blue velvet wings and are surprised to see that the butterfly is no longer there and in its place stands a beautiful young woman. Her hair is full and a lustrous golden color. Deep pools of blue eyes stare back at you from a delicate and perfectly proportioned face. She wears a long gown of deep blues and greens and smells of flowers and soil. Slim delicate arms seem to float gently at her sides and all about her persona is a glowing warmth and gentle innocence that speaks of yearning to know more of this world. She beckons you to rise and you stand directly in front of her turned looking out towards landscape and greenery. She speaks softly and melodiously and tells you to close your eyes and breathe deeply into the vision she will share with you. As you stand, eyes closed, you feel the air chill slightly and the aroma of fragrant flowers is now replaced with damp soil. Instinctively you open your eyes and see that the space in which you began your journey is now in the cycle of early Spring. Tiny green buds barely peek through ground that is dark and rich and recently snow-covered. There is a quiet about the space that speaks of the life that has not quite returned to this place of what will be warmth and sun. All is preparing for late Spring and Summer’s growth still in the darkness of den and earth. Trees have tiny buds of leaf and stark silhouettes of branch are etched against a sky that has not yet been infused with the brilliance of golden and strong light. You turn around to face the Maiden and see that she has gone through transformation and become the Mother, Gaia. Her belly is pregnant with life and she wears a multi-colored cloak of earth’s promise of splendor. You look into her eyes and see the moving waters of stream and waterfall and. Her hair is black as fertile soil and arms and limbs are strong and graceful echoing the symmetry of tree and branch. She is expansive in presence and energy and seems to change at will to portray all of the beauties of the natural world. You stand in awe of her magnificence and as she opens her mouth and sighs long and deeply into the winds you watch as she now changes back into the form of the Maiden and on the next exhalation back into the form of Gaia. You stand in witness to her transformation from one form to other and marvel at this lesson of balanced change in all things so that life may begin anew and be sustained to procreate from itself. Once again the Goddess tells you to close your eyes and breathe deeply. As you inhale you feel the potency of Her breath move as a gentle caressing breeze across your body. You inhale the energy of this breath and feel the seeds of your own understanding of nature and her cycles awakening. You inhale the knowledge of the Goddess and of your own nature as that of the Butterfly and its stages of metamorphosis that bring it finally to its form of beauty, peace and balance. Her breath envelops you and the electricity of its charge flutters throughout your body, like the beating of tiny wings. You open your eyes and find yourself alone and your surroundings once again lush and green, fragrant and pulsing with life. It is slightly darker than when you entered this space. The evening is coming and soon it will be dark and time for restful sleep and renewal. You reach upwards and stretch broadly feeling as though you could gather all of the space within your arms and carry it back with. You feel relaxed and at peace and have a deeper awareness of your physicality is a state of balance. You breathe deeply and draw in the smells and feelings of ease and renewal. You step forward onto the path you entered upon and give one final look back at the nestled space of peace that you found. You take a few steps forward and see just ahead of you a fine light blue mist forming and weaving its energy. As you approach closer you see that is actually hundreds of the blue butterflies weaving and fluttering wing creating a veil. You breathe deeply and step directly into the center as they part and surround you, gentle wings softly beating and reminding you of the peace and calm they offered. You breathe deeper still and utter a soft and gentle thanks and at the release of these words the space clears and you find yourself once again in the space of your inner landscape. You continue to breathe gently and fully and with each breath you become more aware of your physical being sitting in the space you chose for this meditation. You become more aware of the sounds and the smells surrounding you. You become more aware of the rise and fall of your chest moving in the gentle flow of inhalation and exhalation. And, when you are ready, gently flutter your eyes open and be present in physical time and space, relaxed, renewed and serene. Blessings of the Spring Equinox! This entry was posted in Bonus Material, Sabbats. Bookmark the permalink. 1 Response to Happy Equinox!